You can disable the logging of events like wishlist creations or new stock notifications. This saves some database querys and creates less data in your database. If you don’t want to disable logs but want to delete them from time to time you can do so under the tab „Logs“. There you will find a button to truncate all the log entries. There are two ways of storing CSS code generated by the plugin. You can either let the generated css code get embeded into the html of your page directly or store it in a specific file. From an SEO point of view storing css code in a seperate file should always be the go to option. Another advantage of storing custom CSS code in a file are faster loading times since the CSS code doesnt get generated on the fly each time a visitors looks at your site. The time you save is pretty minimal but still, every millisecond counts. If for whatever reason you want the code to be inline with the rest of your html code you can define this here. If you encounter problems with saving style changes within the plugin and you have set the style to be saved to a custom.css file there may be a problem with file permissions present. To change this you need to use a FTP client of your choice navigate to /wp-content/plugins/tp-conversion-booster-tools/style/custom.css and make sure that the file permissions (CHMOD) for the file are set to „644“. This should make sure that your changes can be written directly into the file. We recommend to always enable Google reCaptcha when you choose to enable mail forms that come with this plugin. Your visitors and users are able to share shopping carts and wishlists with others, captchas prevent unwanted bots to fill out these forms on your site. 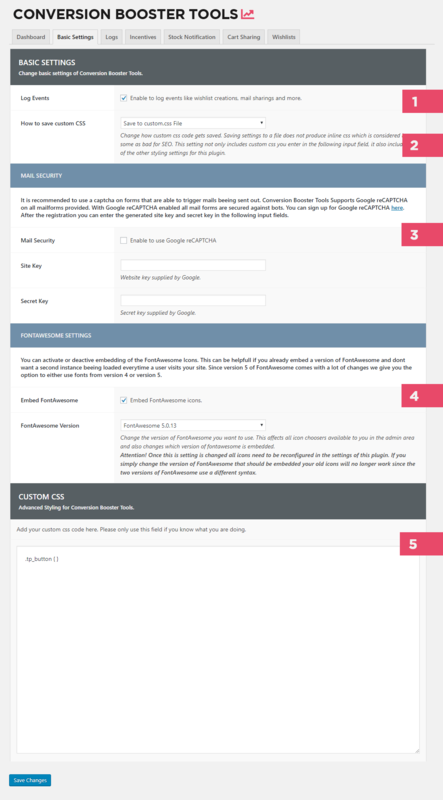 Google provides reCaptcha functionality free of charge, all you need to do is register your site with the reCaptcha API and enter the generated site key and secret key in the plugin settings. Upon activating mail security all forms that send out mails to third partys are protected by a captcha. Since the release of FontAwesome 5 there are more and more themes making the switch from version 4 to version 5. The problem with this change is that the two versions are not completely compatible with each other. Since the Conversion Booster Tools plugin uses icons quite heavily i implemented an option to switch between the two version of FontAwesome. The plugin currently gets shipped out with icons set for FontAwesome 4. You can find out if you need to change this to version 5 by simply looking at the frontend of your site. If the icons you defined for buttons embeded by the Conversion Booster Tools plugin are not correctly displayed ( usually only a square gets displayed ) there is a good chance that another plugin or your theme itself embeds a higher version of FontAwesome. Please Note: Once you change the version of FontAwesome to be used you need reassign all icons in the plugin settings. This stems from a incompatibly with the two versions of FontAwesome. Embeding FontAwesome: If your theme or any other plugin currently installed is not already embedding FontAwesome you can choose to let it be embedded by the plugin. If you know that other parts of your site already embed FontAwesome you can simply deactivate this option to not load a second instance of the icon pack. You can use your own CSS code in this field. Please note that this input field has no error checking functionality which means that all code you enter here gets used on your site whether it has errors or not.